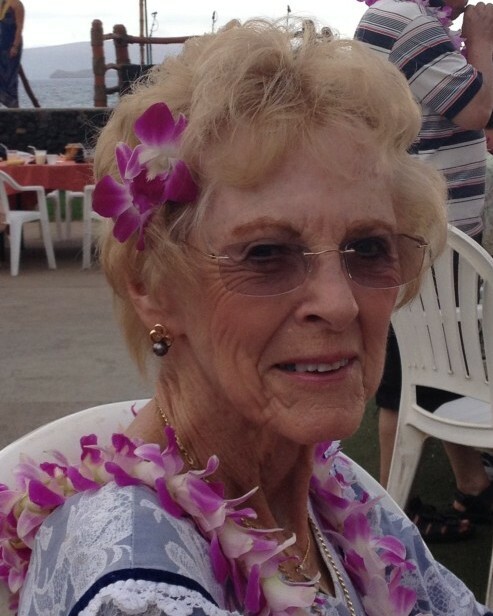 Patricia Stock Meinhart Tullis, age 93, went peacefully to her “Welcome Home” party in heaven on Tuesday, April 2, 2019 after a long battle with Alzheimer’s. She married Roy H. Meinhart on November 25, 1946, who preceded her in death in 1991. Their six children were gifted with unconditional love, faith, and happiness. Their oldest son Paul (Patricia) of Ft Myers FL preceded her in death in 2015. Her remaining children are Sally (Rex) Joiner of Sunbury OH, Mark (Dee) Meinhart of Westerville OH, Karl Meinhart of Columbus, Jan (Joe) Stock of Cape Coral FL, and Mary (Mark) Hays of Canal Winchester; step-sons, Mark (Bettie) Tullis of Toronto, Canada, and Scott (Cheryl) Tullis, of Cincinnati. Patty married Herb Tullis, another avid bridge player, in 1993. They lived a very happy life in Maui, HI and Fort Myers, FL. Herb preceded her in death in 2011. Her children welcomed her back in Columbus in 2017 when she entered a memory care facility. She is survived by her sister Martha of Ashland KY and her brother Jim Stock of Ashville NC. She was “Gramma Patty” to 16 grandchildren and 23 great-grandchildren. As we look back on Mom’s life, we see a beautiful, strong woman who mastered anything she set her mind to. She was a life master bridge player and an avid knitter. She excelled at any needle craft: sewing her own beautiful clothes and creating many quilts. Patty enjoyed cooking and baking for her family. She was a devout Catholic who found great peace and strength in her faith.